Roger Federer guaranteed his return to No.1 in the ATP Rankings after beating Dutchman Robin Haase 4-6, 6-1, 6-1 on Friday to reach the semi-finals of the ABN AMRO World Tennis Tournament in Rotterdam. 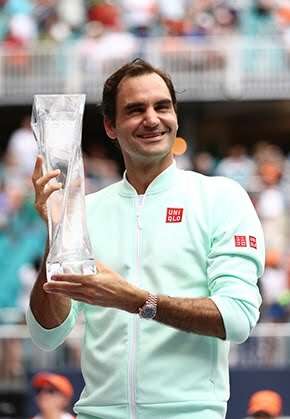 By overtaking Spaniard Rafael Nadal at No.1 on Monday, Federer will break a number of ATP Rankings records - the longest period between stints at No.1, the oldest player to attain top spot and the longest duration between first and last days at the summit of men’s professional tennis. Richard Krajicek, the Rotterdam Tournament Director, presented Federer with a special award in an on-court ceremony. "What an amazing run it’s been and a journey it’s been for me throughout, so to clinch World No.1 again this following Monday here in Rotterdam really means a lot to me, so thank you very much, everybody," Federer told the crowd. "I think reaching No.1 is one of, if not the ultimate achievement in our sport. So sometimes at the beginning you just all of a sudden get there just because you’re playing so well. Later you sometimes try to fight it back and you wrestle it back from somebody else who deserved to be there. And when you’re older, you know you feel like you have to put maybe sometimes double the work in. So this one maybe means the most to me of any achievement throughout my career, getting to No.1 and enjoying it right here at 36, almost 37 years old. It is an absolute dream come true, I can’t believe it." His third straight victory over Haase means that the Swiss superstar has completed a dramatic return from No.17 in January 2017, following a six-month lay-off due to a knee injury. Since returning, Federer has compiled a 63-5 match record, including titles at three of the past five Grand Slam championships, three ATP World Tour Masters 1000s and two other tournaments. Having saved three break points at 1-1, Haase appeared not to have read the script when the World No.42 broke Federer for a 5-4 lead, then calmly closed out the 35-minute opener. Federer refocused and signaled his aggressive intent by winning four first-serve points in his opening service game of the second set, which lasted just 19 minutes. From a 3-1 lead in the second set, Federer won nine of the next 10 games to wrap up the match in 80 minutes. Federer has ensured top spot for the first time since 4 November 2012, five years and 106 days ago - the longest period of time between stints at World No.1. 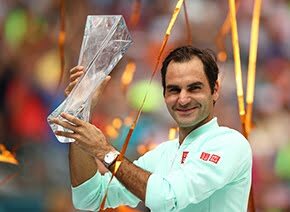 At 36 years of age, Federer is also the oldest player to become No.1, eclipsing the record held by American Andre Agassi, who last held the top spot aged 33 on 7 September 2003. 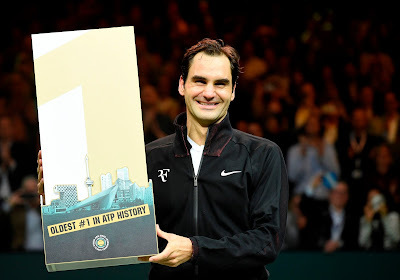 Federer first became No.1 in the ATP Rankings on 2 February 2004 - a record 14 years and 17 days ago - for a total of 237 straight weeks until 17 August 2008. He then returned to the top spot on two further occasions between 6 July 2009 and 6 June 2010 (48 weeks) and from 9 July 2012 to 4 November 2012 (17 weeks). Nadal, his great rival, started his fourth stint at No. 1 on 21 August 2017 - 26 weeks ago - and has been the sport’s leader for 167 weeks in total. Federer, with a 10-0 record in 2018, will now add to his record of 302 weeks at No.1 when the latest ATP Rankings are published on Monday.